"Magnus Chase has always been a troubled kid. Since his mother’s mysterious death, he’s lived alone on the streets of Boston, surviving by his wits, keeping one step ahead of the police and the truant officers. Sometimes, the only way to start a new life is to die . . ."
Really cannot wait for this one. 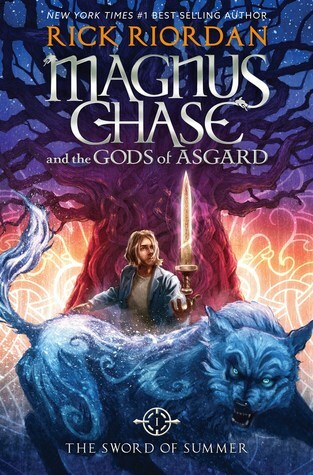 Rick Riordan always delivers fun books and a great take on mythology. The Sword of Summer will be released on October 6, 2016. This one does sound intriguing. Hope you enjoy it. I have not read this series yet. I have heard wonderful things about it. It looks really interesting. Happy waiting! Oh nice! Haven't read this author despite hearing all the good things! I am so excited for this one as well! I've enjoyed everything else he has written so I have high hopes! I'm so excited about this one! I can't wait to read it. Super excited for this one, too! Oh yes! And I love the cover! The colors are soo pretty! YESSSSSSSSS. I am obsessed with Riordan's books! I can't wait for Norse mythology! I am SO interested in it! This sounds really good, and I know my kiddo will love it! Great pick, sweets!